This trip is not available this season. Please take a look at our other options, or get in touch and we'll find you the right alternative. Arrive in the capital city of Iceland and make your way to your included hotel. You will have the day to explore the city on your own. In the evening, join us at your hotel for a welcome reception and orientation. After breakfast, you'll board a charter flight to the northern Icelandic town of Akureyri, where your arctic adventure begins. As our ship sets sail, enjoy some time out on deck, taking in your new surroundings. Have your binoculars and camera ready - you may spot birdlife and whales at sea! Sailing into the peaceful bay of Hornvik, you'll reach the northernmost point of Iceland. This area is encircled by two of the largest bird cliffs in Europe. You can hike an old path, once used by fowlers, out to the majestic Hornbjarg cliffs, which are dominated by millions of seabirds, such as Brunnich's guillemots, kittiwakes and puffins. Encounters with arctic fox are common here. While we cross the Denmark Strait, your Expedition Team will keep you informed and entertained with educational presentations about the wildlife, history and geography of Greenland, your next stop. Join expedition staff on deck and on the bridge as they look out for whales and seabirds, get to know your fellow guests or simply take in the natural beauty that surrounds you. Now we sail south, dipping beneath the Arctic Circle. We'll attempt our first Greenlandic shore landing, on the island of Ammassalik, one of the most isolated inhabited regions on Earth. This is an ideal area to explore by zodiac, offering opportunities to take some stunning photographs. 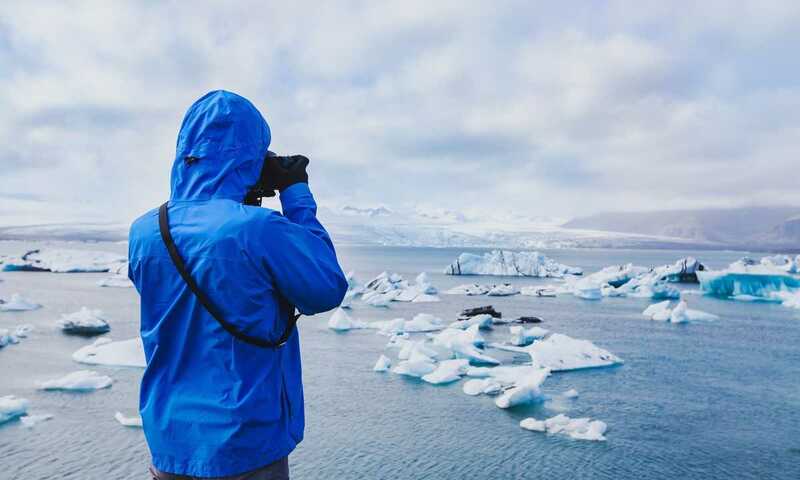 As you venture deep into the spectacular Sermilik Fjord, behold the breathtaking vistas of massive icebergs set against a backdrop of soaring snow-clad mountains. With a population of just over 2,000, Tasiilaq is the largest community in East Greenland. Situated on the banks of the King Oscar Harbour and surrounded by steep peaks, the town offers picturesque views that make a visit here a must. Composed of five small settlements, Ammassalik's chief community is the perfect place to pick up traditional crafts such as soapstone figures, wooden masks and tupilaks (meaning "soul of the ancestor," these carved figures are believed to protect its owner against enemy attack). You'll also want to wander between the vibrant painted wooden houses that dot the lush landscape. South of Ammassalik are many fjords, which are deep, steep-walled valleys along coastlines flooded with seawater. You'll cruise in a zodiac through the Bernstorffs Fjord in search of glaciers. Bernstorffs Fjord means "ice fjord," and there's a good chance we'll encounter calving icebergs at the fjord head. You also may have an opportunity to go ashore to hike. Experience an authentic arctic ghost town, the abandoned Skjoldungen settlement. In the early 1960s, as part of a nationwide program to concentrate Greenland's population in a few select sites, the inhabitants were relocated to larger, more accessible communities. After exploring the town's remains, you'll cruise the Skjoldungen Fjord in a zodiac and be amazed at the striking contrast between the deep green sea, white icebergs and dark mountains. Those who opt to kayak here may be able to take some up-close shots in the country where kayaking was invented. Ships rarely venture into Lindenow Fjord, the least-occupied fjord in Greenland. With your Expedition Team in tow, you'll cruise by zodiac in an arm of the fjord, as our staff use their years of arctic experience to search for bearded seals lying on the pack ice. You may also spot waterfalls along the sheer rock face. 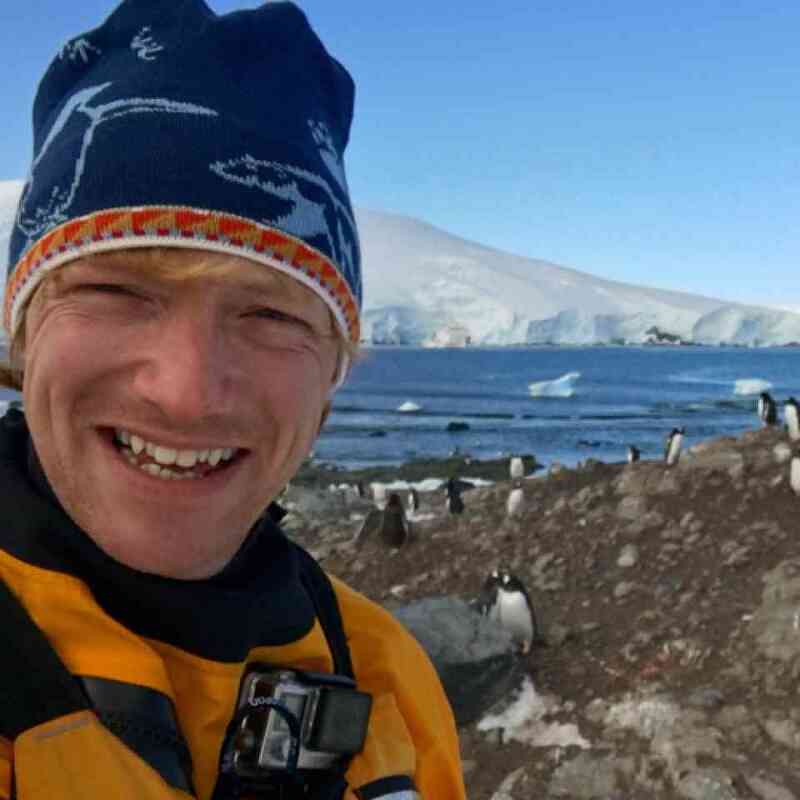 Prins Christian Sund is made up of a spectacular series of massive tidewater glaciers. A mountainous region laced with fjords, it's an attractive area to explore by zodiac, if the ice allows us to navigate with ease. Rounding the southern edge of Greenland, we'll land at Narsaq Kujalliq, also known as Narsarmijit. Founded by Herrnhut missionaries in 1824, it's the country's southernmost settlement, 31 miles (50 km) north of Cape Farewell. You'll explore Herjolfsnes, the site of an excavated Norse farm, and also have the chance to hike in the area or soak in a natural hot spring while icebergs float by. Welcome to the land of hot springs! A common natural phenomenon in Greenland, heated springs have lured visitors for thousands of years. On the uninhabited island of Uunartoq, three springs form a small stone-dammed pool that's warm enough to bathe in. Surrounded by soaring mountain peaks, you can relax in this outdoor spa and contemplate the surreal scenery around you as majestic icebergs drift by. In the fertile region of South Greenland, you'll visit the well-preserved ruins of a Norse church in Hvalsey. Walk amongst the towering stone walls, and you'll feel the presence of the settlers who used to gather here before the site was abandoned in the 15th century. The Nearby fells and fjord have not changed over the centuries. As you sail toward Paamiut, you'll be struck by the beauty of the surrounding dark blue mountains. Known for its mysterious fog and pleasing blend of old and new culture, the town has its own guardian: the white-tailed eagle. Inhabitants feel a strong connection with the king of the birds, and legend has it that good luck will come to those who spot it (easy to do, as they're seen in large numbers here). Simply smile at locals, and they'll enthusiastically share their fondness for their town, and fishermen will happily talk about their trade. You'll have the opportunity to hike a nature trail that's a thousand years old. You also may be able to spot fin, humpback, minke or killer whales from shore. 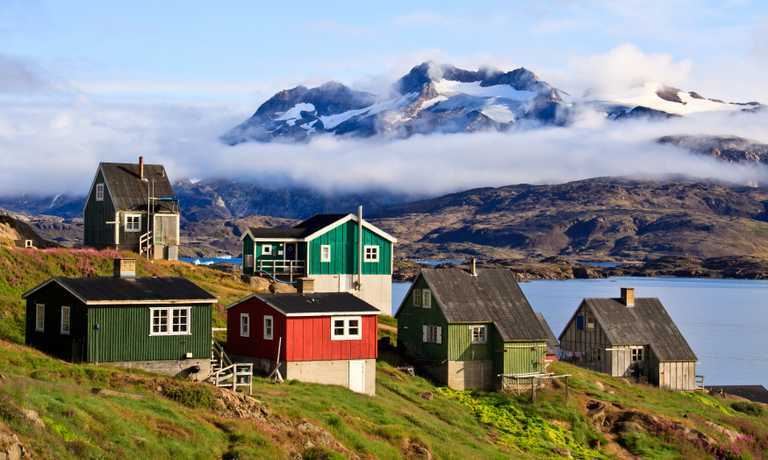 History and culture buffs will find plenty to do in the bustling Greenlandic capital of Nuuk. Wander along to the waterfront to see the Hans Egede Church and Hans Egede statue, both named after the missionary who founded the settlement in 1728. At the Greenland National Historic Museum, you can view the 500-year-old remains of fully dressed mummies, found in 1972 after two brothers out grouse hunting discovered their graves under a rock outcrop. Also worth exploring are the Katuaq Culture Centre and Nuuk Art Museum. Today, we sail across the Davis Strait, a major summer feeding ground for walrus and narwhals. Our informative presentations will prepare you for your Baffin Island adventures. During this time at sea, it's easy to stay entertained: learn to identify seabirds on the wing, share photos and swap stories with shipmates, lounge with a book in our Polar Library, savor a glass of wine in the bar or get active in the exercise room. Or simply stay up on deck, enjoying the impressive sea views. We'll trace the southeastern coast of Baffin Island, the largest island in Canada and the fifth largest in the world. In this land of glacial lakes, an abundance of vibrant wildflowers such as yellow arctic poppies and purple saxifrage are scattered across the fertile landscape. Your time here will be spent going on wildlife excursions by zodiac, hiking the tundra and visiting fishing villages and traditional Inuit settlements, learning about the local history and culture. Dubbed the Switzerland of the Arctic, the Inuit hamlet of Pangnirtung is nestled beneath the jagged, frosty peaks of Mount Duval, at the mouth of the picturesque Pangnirtung Fjord, which merges with the Cumberland Sound. Artists in Pang, as locals call it, are renowned for their traditional Inuit arts and crafts, especially intricate woven tapestries and lithographs. Here, you can visit the internationally acclaimed Uqqurmiut Centre for Arts & Crafts to watch craftspeople in action in the tapestry studio, purchase a limited- edition litho at the print shop, and even pick up a colorful Pang hat (with matching scarf and mittens) to keep you warm during the rest of your arctic adventure. Nearby, you'll explore the historic remains of a whaling station on the small uninhabited island of Kekerten, and imagine what life was like long ago. Settled in 1840 by Captain William Penny, a Scottish whaler, the area is now a National Historic Site of Canada. During the height of bowhead whaling in the late 1800s, the station was the most important one in the Cumberland Sound area (the slopes along the harbor were ideal for scouting whale activity). The site represents the impact that the industry had on the culture and economy of the Inuit in the sound, as locals adapted to the rhythm of the whaler's year. Expect more wildlife sightings at Monumental Island, located off the southern coast of Baffin Island. Though uninhabited by people, the island is a well-known habitat of some of the Arctic's most magnificent animals. As you cruise in a zodiac along the rocky shores, keep your eyes peeled for hauled-out walrus and prowling polar bears. Cruising in a zodiac through the narrow channels separating the three rocky islands of this uninhabited archipelago, there's a possibility of seeing polar bears meandering the rugged coast. Before disembarking in Iqaluit, you'll have a chance to bid farewell to your Expedition Team and shipmates. After, board your direct charter flight to Ottawa, where you'll spend the night at your included hotel. Today, you can make your way to the Ottawa airport to connect with your homeward flight, or spend more time exploring Canada's capital if you have booked additional accommodation. This trip can run as a group trip, with prices starting from $8,995 per person for a complete group. If you are looking to join a group or you are a solo traveller we will help to form likeminded groups of travellers. Please let us know your travel plans. There is a mandatory $695 per person transfer package on top of the voyage cost, which includes 2 charters flights and 2 nights hotel accommodation pre and post voyage.